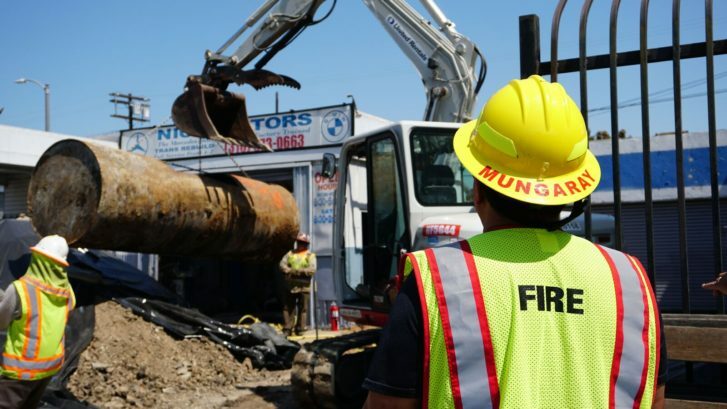 Terra-Petra was recently contracted to consult and remove 5 underground storage tanks (UST) and one hydraulic lift on a site in Lynwood, California. These tanks have been left dormant for many years on an old gas station that is not currently operating. Each tank contained a limited amount of liquid, which requires special permitting, special pumping treatment, and special handing and distribution. The tanks are a variety of sizes, ranging from 100 gallons to 500 gallons, and located a depths ranging from 10 feet below surface to 20 feet below surface. Underground storage tanks (USTs) are considered abandoned when regulated substances are no longer stored within those USTs and/or when monitoring requirements of the Operating Permit, Title 23 of California Code or Regulations, and California Health and Safety Code 25298 are not being implemented. Various risks can arise from abandoned USTs when they are not properly closed in place such as the possibility of leaked hazardous substances and contamination to the environment. Therefore it is important that sites with (possible) presence of abandoned USTs be addressed in order to avoid the consequences. The permitting process through LAFD went very smoothly and efficiently (Terra-Petra has a great relationship with the agency). The process, from start to finish, took approximately 5-working days, including the required onsite soil testing as the tanks are physically removed.